As martial artists we routinely subject our bodies to rigorous physical demands. We demand more of our bodies in training, then in many other sports or exercise regimes. We train for lightening fast reflexes, flexibility, near superhuman strength and physical intensity, cardiovascular stamina and endurance and in harder styles condition ourselves for combat, to be hit, suffer physical trauma and continue moving, to continue functioning at peak performance. There is a price to be paid for such skill, for the results of training. Often it is injury. Muscle strains, bruises, black eyes and even broken bones. And we know it’s worth it. Some injuries are less sudden and dramatic, creeping up over time to challenge us. Joint pain, particularly in the knee’s hips, elbows and wrists is a common feature. Too many snapping mai geri’s or one to many days striking the makiwara can result in repetitive strain and stiff aching joints. That’s what happened to me. After 12 years of dedicated practice my knees were beginning to ache. It started as a dull sensation, a feeling of trapped air just below the knee cap. Soon after I could hear it creaking with each movement. But I continued training regardless. I could put up with a dull ache because I would not tolerate missing training…but slowly, gradually it crept up on me, till one morning I woke from a restless sleep to find my knees just couldn’t support me. I’d stopped cycling a few weeks before, I’d reduced my walks, and I admit it I was less then delighted when we did kicking drills. Now as a result of misplaced machismo I was unable to walk without pain, unable to function – unable to practice karate. The funny part was I had just turned 19, and was hobbling like a man in his 90’s. I dragged myself to the doctor’s (under protest I may add). The diagnosis was simple my knee’s were worn out. I’d have to get new ones, learn to walk again and never train in karate. To say I was crushed was an understatement. Being young and stubborn, by which I mean down right stupid, I refused treatment, argued that there had to be another way. Luckily for me I was right. I was advised to see an acupuncturist, so being desperate I did. I was diagnosed with Cold Invasion of the Joint…now that sounds weird doesn’t it. But it’s actually quite a good explanation…As I was to learn later in Traditional Chinese Medicine many patterns of disease and illness are described with metaphors. Think about your fingers when it’s really cold outside, the joints become cold, stiff, and have that tight constrained sore feeling when you move them – pretty much what was happening in my knee. The acupuncturist took 5 needles and put them in the “eyes of my knee”. 6 Sessions later I was pain free. At the end of my 12th my knees felt incredible - Strong supple and capable of delivering confident kicks and sustaining deep stances. It had such a profound effect on my life that I began studying Acupuncture and Traditional Chinese Medicine so that I could treat my family and friends to the same quality of health I now enjoyed. In my clinic I see many martial artists with varying degree of injuries, from simple sprains to more chronic pain such as I experienced. Many of these injuries can be treated by simply massaging particular acupuncture pressure points on the legs, arms and head. 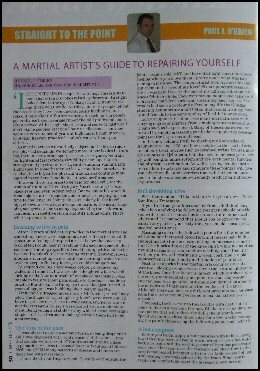 In this new column, I will be sharing my knowledge of TCM and Acupuncture and how it relates to the martial arts to not only treat injuries such as sprained wrists, bruises, muscle soreness and joint pain, but also how to increase your energy, well being, immune system and yes, even mental function and physical co-ordination. As well as giving detailed instruction on how to activate and stimulate these points I will give you advice on diet and exercises that will further enhance and stimulate your bodies own energy production and recovery systems. With that in mind, I’d like to share with you my own Never Sore Knees Treatment. If you find that your knees suffer from a dull throbbing ache, then applying the following treatment should provide you with relief. Of course this is no substitute for medical advice and I recommend that should you be experiencing pain in any part of your body that you should consult your medical practitioner. Massaging each of the following points for a few minutes will stimulate increased blood flow, and release pain killing endorphins into the knee stimulating an increase in sinovial fluid (the lubricating oil of the knee joint). While not as effective and dramatic as needling you will find that with only a few self treatments a week you will find a rapid improvement in the fluidity and function of your knee. Most knee injuries in the martial arts occur as a result of over use e.g. kicking, which wears down the natural lubricants of the knee. The other factor is impact, which can shock Qi – the energy manipulated by acupuncture and acupressure and can lead to stagnation and bruising and poor circulation around the muscles and ligaments and tendon’s of the knee. Although there can be many different presentations for knee pain, the most common I have found in martial artists is Cold Invasion. Obviously the best way to treat cold is with heat, but I’ll come to that in a moment. For now I’d like to discuss the pressure points that will relieve the dull ache in your knees. Spend 10 minutes, 3 times a day for a few weeks massaging the painful knee using the following points and methods. Before you begin apply a hot compress with a thick, heavy towel that has been soaked in warm water or use a hot water bottle or pad until the soothing sense of heat has penetrated your knee. Heat improves the viscosity and blood flow to the area being heated, bringing with a veritable cocktail of natural healing chemicals released by the brain. When you’re ready and comfortable start the following massage. Simply press the points pictured with a firm even pressure while breathing deeply in through the nose and out through the mouth. Next you can apply a light massage over those points with some Tiger Balm or Deep Heat, infusing the muscle and the joint with a nice soothing warm heat, stimulating the flow of blood and fluid to the knee. Finally work from the inside out and take some Ginger Tea, three times a day. It’s very simple and easy to make, simply get some stem root ginger in the local supermarket, peel the skin and add to thin slices to a mug of boiling water. Let that gently infuse for a few minutes and sip it down over 10 minutes. This adds a soft internal heat that benefits the muscles and joints. The only thing I’d say on that thought is not to take ginger tea if you suffer from any skin rashes, dry itchy eyes, and dry itchy, flaky scalp as adding more heat to your system may make some of these conditions a little worse. If you have any questions feel free to ask your local acupuncturist or contact me below. Now that your well on your way to New Knees, don’t over do it but gradually introduce a full range of movement and light exercise to supplement the healing effect of acupressure, you’ll be kicking stronger and harder then ever. Next issue we will look at treating wrist and ankle injuries. Till then remember to go with the flow.